Few movies bring about the kind of change that 2001: A Space Odyssey when it burst onto screens in 1968. With amazing attention to detail and a variety of thematic approaches, Stanley Kubrick and co-writer Arthur C. Clarke explored the origins and destiny of man, while contemplating the nature of life and the dangers inherent in technology, with a smattering of aliens as veritable deities that control evolution across the galaxies. Kubrick famously began his film not in 2001, but at the dawn of man, as a group of man-apes are driven from their watering hole. Suddenly a massive black monolith appears in their midst, placed by aliens interested in jump-starting their evolution. Before long, they have learned to utilize tools, and in the most famous jump cut in all of cinema, we see the ape man's bone weapon hurled into the air, only to become a floating satellite of a future world. Dr. Heywood Floyd (William Sylvester) is being sent to the Clavius moon base to investigate a mysterious black monolith found buried beneath the lunar crust. When sunlight stikes it after eons, it emits a short burst of radio waves, like an interplanetary car alarm, in the general direction of Jupiter. Eighteen months later, the spaceship Discovery is sent to Jupiter on a mission so secret that the only participants who know its purpose are placed in deep hibernation before departure. The day-to-day management of the ship is handled by Dave Bowman (Keir Dullea) and Frank Poole (Gary Lockwood), assisted by the HAL 9000 supercomputer (Douglas Rain). What Dave and Frank don't know is that HAL is such advanced AI that he has developed paranoia, and has decided that the mission is too important to allow it to be jeopardized by human error. 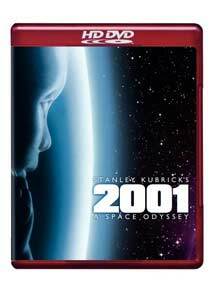 2001 is justly celebrated for its amazing, then state-of-the art visuals, and they hold up surprisingly well even today. In particular, the sense of deep space is very well developed, with the concomitant isolation. The spherical lunar lander moves like a weighty, enormous piece of equipment, and then there is a wonderful surprise as it is then gently lowered into an underground bunker. There is quite a lot of time spent on the minutiae of space travel, reflective of its era when it was a burning question as to how one would move about, eat, or more importantly, go to the bathroom. The weightlessness is deftly carried out through a series of simple practical tricks, but as Peter Jackson proved even today the simplest methods are the most convincing. Many of the film's effects have seldom been equalled, and almost never surpassed. The goal was to make everything look real, and it's quite successful. At the same time, the design is highly evocative at all times. The unblinking red eye of HAL is disturbing, especially at the moments where Kubrick stutter-cuts closer and closer to it. Few moments in film are quite as terrifying as the moment when an unsuspecting Frank Poole, weightless and helpless, is suddenly turned upon by the pod under HAL's control; the shot of the pod drifting toward the camera and suddenly opening its claws still packs a punch after many viewings. But more than anything Kubrick wanted to make a science fiction movie that took the genre out of the ghetto of westerns-in-space, and make a film full of ideas, and in that sense he succeeded most admirably. There are always points to ponder throughout, from evolution to technology to the nature of humanity, and the laconic pacing (think Antonioni-in-space) gives one a moment to reflect while enjoying the gorgeous compositions and amazing effects. The dialogue is almost nonexistent, and that which does not consist of platitudes (an endless stream of "How are you", "Give my regards to..." and "Happy birthday" make up the bulk of it), is for purposes of deception or disinformation. Most notably, Dr. Floyd's deft parrying of questions from some Russian colleagues about the strange silence from Clavius, by pointedly refusing comment on a rumor planted as misdirection. And most famously, there's the issue of HAL's breakdown, possibly triggered by the requirement that he conceal from Dave and Frank the true nature of their mission. Even after seeing the picture at least 30 times, different matters come to the fore. This time, I noticed for the first time that the title card "The Dawn of Man" isn't followed up until the Discovery is on its way to Jupiter. Kubrick and Clarke may be suggesting that we are still in the dawn of man, not all that far removed from the ape using a bone to bash in the brains of a tapir. Kubrick also here began his habit of being meticulous about the music utilized. Is it possible to hear The Blue Danube without thinking of space ships? But it works perfectly to capture the graceful ballet of the vehicles in space. Khatchaturian's marvelous Gayane ballet is borrowed to underline the monotony of life alone in space for a period of a year and a half, while Györgi Ligeti's haunting compositions make for a disturbing transition through the Star Gate as Kubrick hurls all manner of psychedelia at the audience for 9m:26s. And most famously, there's Richard Strauss' opening to Also Sprach Zarathustra, lifting a somewhat obscure piece into permanent fame as the most famous fanfare in the world. It, like the Johann Strauss waltz, is indelibly linked to 2001 for better or for worse, and a more perfect piece of music for the influence of the monolith could hardly have been chosen. Ominous and threatening from its first note, its trumpets transition from failure and despair to exultant triumph. One could not want a better metaphor for the themes of the picture and the quixotic nature of the picture itself. Image Transfer Review: I was somewhat nervous about approaching this HD DVD, since I had seen the presentation of 2001 on HDNet Movies, and was disappointed by the heavy edge enhancement that spoiled the effect of the picture. There are a few sequences where it's visible here, such as on the tusks of an animal skull near the beginning, and around Dr. Floyd while he's aboard the space station, but for the most part it's not readily noticeable and doesn't detract seriously from the picture overall. There is a mild bit of posterization on the images of the sun, too, for those who are picky. But on the whole, the visuals are detailed and look terrific. The black of space looks perfect, and the sometimes impossible patterns in the background, or the floor tiles about the Discovery, are rendered in rock solid manner. Kubrick's use of color is almost overwhelming, particularly in the blinding whites and the heavily saturated reds. The color is often shocking, but it prepares us for Dave Bowman's final psychedelic journey, which is heavily dependent on color. The trip is dazzling, with some particularly disconcerting moments that come across very well. In a perfect rendition, the instructions for the Zero Gravity Toilet should be clear and readable; they're readable about half the way down, which is far more than has been possible on any prior home video rendition. The modest grain structure is rendered faithfully and smoothly. Audio Transfer Review: Both DD+ and True HD tracks are provided, and the latter is exceptional, thanks to the classical music. The low organ note that opens Also Sprach Zarathustra comes through with plenty of power, and the brass fanfare has fine bite. But the best part is the visceral thumping of the timpani in between each call; the rattle of the mallets against the head of the timp is audible as if it were right there in front of you. The Ligeti pieces are piercing in their frightening and disturbing beauty. The Blue Danube is a shade on the shrill side in the woodwinds, though to my recollection that is an issue with every presentation of this film; it may be inherent in the recording. The Star Gate sequence offers plenty of surround activity, and you had better make sure that they're full range and able to take a beating. The monolith's signal from the moon is just as piercing as I remember it in the 1968 theater. A superb audio track that befits one of the greatest soundtracks of all time. Extras Review: This movie has always been poorly served for bonus features on its previous DVD incarnations. Happily, Warner has more than made up for lost time with a huge selection of extra features, none of which are fluff. There's enough here to keep the fan busy for many hours. Alas, none of it is presented in HD. Starting off matters is a full commentary with leads Keir Dullea and Gary Lockwood; even though they're not in the first third of the picture, they've clearly done their homework and speak knowledgeably about the techniques and the process of filming the entire picture. There are a few quiet spaces but on the whole they do a better job with the commentary than one might expect. 2001: The Making of a Myth (43m:05s) is a quite solid making-of, featuring Clarke, Dullea and others speaking about the creation of the movie, the special effects and addressing some of the thematic content, such as remarks by AI experts. Standing on the Shoulders of Kubrick (21m:24s) looks at the influence of the picture on such notables as Spielberg and Lucas, who offer their impressions of having seen the picture. This is the most dispensable feature, but everyone involved has an interesting perspective. Vision of a Future Passed (21m:30s) addresses the science fiction predictions of the feature, and what has and hasn't come true. It's modestly depressing to look at how optimistic the 1960s were about the possibilities of space travel, only to be shut down completely in the early 1970s by the expense of the Vietnam War and the short attention spans of the American public. A Look Behind the Future (23m:10s) is a period documentary about the filming of the movie, which gives a fascinating glimpse behind the scenes. What Is Out There? (20m:41s) offers ruminations, hosted by Dullea, addressing the notion of alien life, the alien as God, and what the nature of such alien life might be. 2001: F/X and Early Conceptual Artwork is fairly self-descriptive, with some interesting analysis of how the various effects of the Star Gate sequence were accomplished. The final featurette collects some of Kubrick's photographs for Look magazine in the 1940s and 50s, covering the famous and mundane, the serious and the ridiculous. They're very attractively reproduced with more care than is often given to such galleries. One of the more fascinating extras is a lengthy 1966 audio interview (1h:16m:26s)with a surprisingly chatty Kubrick, who discusses his life and career with mild impatience but in a far more forthcoming fashion than I've ever heard him do anywhere else. Finally, a trailer packed with laudatory pull quotes pulls no punches about this being a masterpiece. Still stunning and dazzling in so many ways after nearly 40 years, Kubrick's great masterpiece explodes onto the screen in HD glory and accompanied by a wealth of valuable extras. If you only own one HD DVD, it should be this one.